Journals and God-inspired dreams go together. And journals also go together with self-discovery, self-expression, self-care, healing and personal transformation. I am a BIG advocate and believer in the power of pen and paper. It is a tool that can help create positive and lasting change in our lives. When I was in the eighth grade, I was gifted my first journal. It was one of the best gifts I could have received because it was the start of what is now a lifelong practice and passion. If you were to peek into my bag, you would find a journal and a bunch of colored gel pens. I am always prepared to write at a moment's notice because I never know when I will need to capture something on the page. Journal writing has helped me in many ways, but what I love most about keeping a journal is the freedom it allows for me to be honest and real about who I am, what I feel, what I think and what I want out of my life. "I don't know how to start." "I don't know what to write." Below you will find some tips to combat these myths and get you started on the journal writing path. 1. 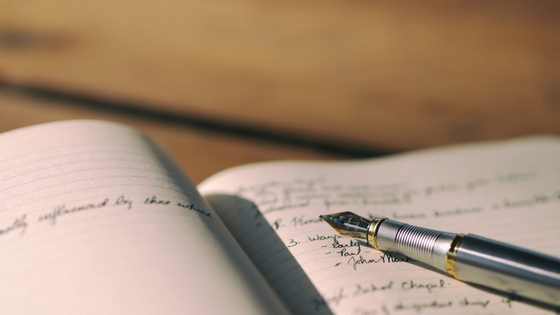 Journaling can be accomplished in as little as five minutes. It is a flexible practice that can be done anywhere and at anytime. The most important thing when keeping a journal is to be able to write something down on the page even if that something fills only one line of paper. 2. The only way to start anything is to just begin. A pen, paper and a little bit of time are all you need for journaling, along with putting your first word down. When starting out simple is always better. 3. There are many journaling techniques available such as lists, and the unsent letter, but my favorite is the free write. With this technique, you simply write whatever comes to your mind. Freewriting allows you to access not only your conscious but also unconscious thoughts and feelings. You can even begin by writing on the page, 'I don't know what to write.' and see where it takes you. Journal writing is simple, flexible and can easily be customized to fit your lifestyle and your needs. It is also a practice that offers many benefits to every area of your life. In order to help more women learn about the power of journaling and how to incorporate it into their lives, I created the audio course Creating A Journal Writing Practice. Learn more about the course here. Are you signed up for my weekly newsletter? Click here to receive a new edition every Friday delivered to your inbox. Pen*Paper*Write is a free journal series offering monthly themed based prompts, quotes, affirmations and creative journal writing exercises to help you develop a deeper practice. Sign up here.